Even though this Chicken Pot Pie recipe calls for a decent amount of ingredients and a bit of chopping, this recipe is actually quite simple. It doesn’t take to long to make, and is actually a big time saver by using a rotisserie chicken. I love finding recipes that call for rotisserie chicken, or cooked shredded chicken in general. It is so easy to stop by the super market and pick up a rotisserie, you can make super delicious meals, like this Chicken Pot Pie, in a snap. 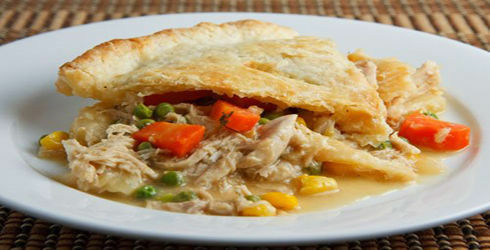 Summary: There is nothing better than a Chicken Pot Pie to comfort you, especially on chilly nights. In a large saucepan, heat chicken broth and bouillon cube over medium heat until hot. In a Dutch oven, melt butter over medium heat. Add onions, carrots, celery, chives and garlic, and sauté until tender. Season with salt and pepper. Add the flour and stir together until it becomes pasty and lump-free, about 2 minutes. Stir in hot broth, heavy cream, sherry, chicken, and frozen peas. Bring to a boil then reduce to a simmer. Roll out your pie dough, slightly. With a 9-inch pie dish or one a little larger, place one of the pie dough. Place the pie dish on a baking sheet (to help prevent any possible spills in the oven). With a ladle, fill the pie dish with the filling. Once the dish is filled, take your other pie dough and place over the top. Crimp the dough over the edge with the bottom dough. Brush with the egg wash and make 4 slits on the top to help release the steam. Sprinkle with some kosher salt. Bake for 35 minutes, or until crust is a nice golden brown. Remove from oven and serve. Add other vegetables and seasons as you prefer.